Home Away From Home, In Secure Gated Community. Beautiful home located in Carretera Masaya in a gated community with 24/7 security, close to restaurants, gas station, malls & popular tourist attractions. A/C in most rooms, washer and dryer, Iron and ironing board, hair dryer, towels, kitchen, etc. Our home is perfect for your vacation or business trips. 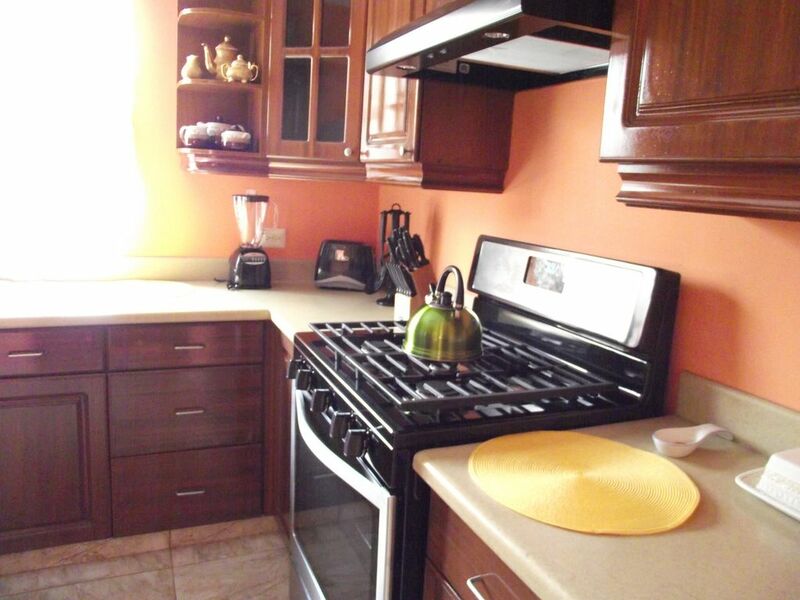 Fully equipped kitchen including toaster, microwave, blender, coffeemaker, gas stove, fridge, utensils, cups, plates, spoons, pots and pans, etc. Free Wi-Fi and High Definition TV in the living room and master bedroom, blu-Ray player available in living room. 3 bedrooms with Queen beds, 1 room with twin bed. Laundry area is equip with washer, dryer, and Lavandero. Water Storage Tank System and hot water available in all showers. Front porch with 2 rocking chairs. Terrace with rocking chairs and gas BBQ grill available for use. Backyard-Gazebo, patio furniture, built in BBQ. Check in time between 2:00 p.m.
No big events. No pets allowed. You will be met by the host at check in and provided a set of keys for the house and meter reading at check in and check out. Transportation available to and from airport and local tours for an additional fee. Maid and cook available for additional fee. We are located near many restaurants, Masaya Zoo, 15 minutes from Valcan Masaya, many grocery stores, pharmacy and hospital near by. Please do not hesitate to contact me for help or any questions that may arise. I have stayed here multiple times and I still find absolutely nothing I would change in the place if I owned it myself. I mean nothing- from the plates to the beds to the TVs. Perfect! Exactly like last time- Perfect. I stayed here for about three weeks and usually if you are at a place long enough you will find things that you do not like. I really found nothing I did not like and I actually started referring to this place as home; so much that I took a personal interest in making sure the plants were taken care of and when I had guests over I asked them to take their shoes off like I do in my own home! I do have one other thing to add to my last review - there is a great Gym within walking distance from the house (maybe 200 meters away), and they do offer daily rates. I also discovered more restaurants that are just a few km away heading to Managua. Oh, also, the owners response time was great as I had to extend my visit and they responded to my request very quickly so there was no concern about whether or not I had a place to stay for an additional few days. Definitely recommend it. I normally do not take the time to respond to these ratings surveys however, this place was just perfect. Cleanliness: Unbelievable. Security: there were several guards at all times and the neighborhood just had the "appearance" of being a very safe place. Location; Excellent - A quick drive into Managua or Masaya, and Granada might be a 25 minute drive - tops. Owners: Very nice and responsive. If I had a question about something they responded right back. I actually wanted to leave them a thank you gift. I rented this house because I often travel from the U.S. to Nicaragua for work and got tired of eating out all the time and wanted some place that did not have the "Hotel/Work" environment/feel. It was exactly what I was looking for and if the owners would have me back, I would definitely stay there again.